Hillhead Primary has been awarded the prestigious Game On Plaque for its commitment to learning about the Commonwealth Games 2014. 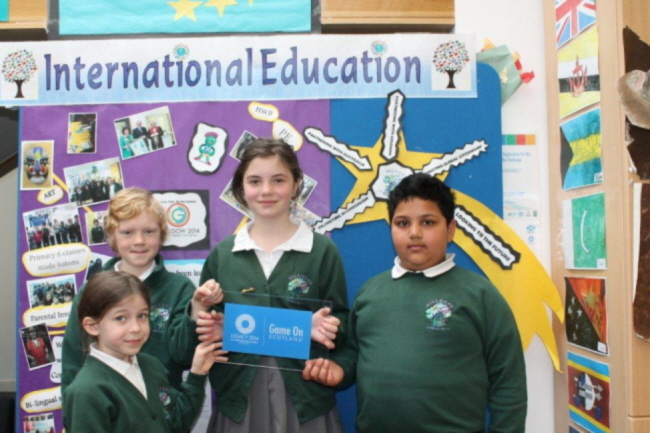 The whole school took part in an interdisciplinary topic using the Commonwealth Games 2014 as the context for learning through International Learning. High quality art work created by our pupils was entered for the Athletes’ Village Art Competition led by Mrs McMath. We also celebrated Commonwealth Day by wearing trainers and sporty gear with a Commonwealth theme. We also earned an enhanced visit from Clyde, the Commonwealth Games mascot , during this visit we also met Game On Scotland Ambassador Michael Jamieson who will compete for Scotland in the 2014 Commonwealth Games. Preschool children from the Kelvin Park Early Years Centre, who share our campus, were invited to join our P1 pupils in a Commonwealth Sports Event. Upper school pupils created amazing Power Points and leaflets. Pupils in the middle stages learned about different countries and shared their learning with other pupils. We recently held a very successful Open Afternoon for our parents and carers to celebrate our interdisciplinary learning about the Commonwealth Games 2014. Each parent/carer was given a “Passport to the Commonwealth” booklet to complete while looking at displays made by every class. They talked to our “ambassadors of learning” (children from each class) who displayed items and children’s work related to their topic. We were given excellent feedback from our parents and carers about their “learning experience”. They were very impressed with our children’s knowledge and excellent displays of work. As a school we have embraced our learning about the Commonwealth Games 2014 and through this context we continue to grow as a school of successful learners, responsible citizens, effective contributors and confident individuals. As a result we are very proud that due to our commitment and hard work we have been presented with theprestigious GAME ON PLAQUE!